“MARY QUEEN OF SCOTS”: Let the machinations begin!!! The story of Mary Stuart, the Scottish Queen, and her long-running rivalry with England’s Elizabeth I is one of history’s great dramas. Heck, it even ends in a beheading. So why do cinematic treatments of the yarn always feel so hidebound and emotionally remote? In part it may be because the two women never laid eyes on one another. Their stories run on parallel tracks, but there is no intersection. The new “Mary Queen of Scots,” with which storied stage director Josie Rourke makes her feature film debut, solves that problem (sort of) by inventing a meeting between the two monarchs. This allows two terrific actresses — Saoirse Ronan and Margo Robbie — an opportunity for a bit of hand-to-hand thespian combat. But it’s not enough to make this big fat slice of history dramatically compelling. Which is not to say there’s nothing to like here. The film is filled with spectacular scenery and some of the dankest, dimmest castle interiors in movie history. The costuming is lavish. And then of course you have these two actresses playing a long-distance game of diplomatic chess with the future of the English monarchy at stake. The film begins with Mary (Ronan) returning to Scotland after a long sojourn in France, where she had married a prince who promptly died on her. She reclaims her throne from her brother James (Andrew Rothney), who will launch a civil war against her. Mary poses a real threat to her cousin Elizabeth (Robbie), who is unmarried and indifferent about producing an heir. Should Elizabeth die childless, the Roman Catholic Mary would inherit the throne of Protestant England. Crammed with famous faces and centering on a bit of real-life WW2 cloak-and-dagger that almost defies credulity, “The Catcher Was a Spy” is both a thriller and a flawed character study of a man who refused to be characterized. Indeed, even before he was recruited by the O.S.S. and trained to be an assassin, Morris “Moe” Berg (portrayed here by Paul Rudd…probably too boyish for the role) was a bundle of puzzling contradictions. Berg had degrees from Columbia, Princeton and the Sorbonne; he spoke seven or eight languages fluently and could get by in several others. Yet he made his living as a professional baseball player, serving as the second string catcher for the Boston Red Sox. As presented in Ben Lewin’s film, he is well spoken, erudite and bisexual, augmenting his domestic life with a live-in girlfriend (Sienna Miller) with visits to underground gay nightspots. Shortly before the beginning of the war Berg was named to an all star team (Babe Ruth and Lou Gehrig participated) on a good will tour of Japan. While there he became convinced that war was inevitable and, on his own, climbed to the roof of a Tokyo skyscraper so that he could film military installations and harbor facilities. There must be something about the wide open spaces of Australia’s outback that drives its filmmakers to post-apocalyptic nihilism. And now David Michôd with “The Rover,” a sweaty, dusty saga about a man in search of his kidnapped car. Michôd scored a minor coup in 2010 with “Animal Kingdom,” an intimate portrait of a low-level Aussie crime clan that introduced to American audiences the great Jackie Weaver (who nabbed an Oscar nomination). It was a dark, generally hopeless look at the ties that bind its characters to an evil enterprise. Now Michôd goes full-tilt dystopia. The opening credits of “The Rover” informs us that the story takes place 10 years after “the collapse,” a worldwide economic meltdown that has left most of humanity struggling with chronic poverty. It seems that inside every comic genius there lurks a tragedian just itching to break out. The latest funny person to make the leap into seriousness is former “SNL” star Kristen Wiig, who in “Hateship Loveship” excels at poartraying a lonely woman who risks all on a last desperate attempt at happiness. Wiig plays Johanna, who as the film begins is a care-giver for an old lady in small-town Iowa. Johanna has no family and has been with the old lady since she was 15 — or more than half her life. As a result she is emotionally and intellectually naive, not to mention painfully shy. With her employer’s death Johanna finds a new job in the household of lawyer McCauley (Nick Nolte), a widower caring for his teenage granddauther Sabitha (Hailee Steinfeld, an Oscar nominee for the Coens’ “True Grit”). 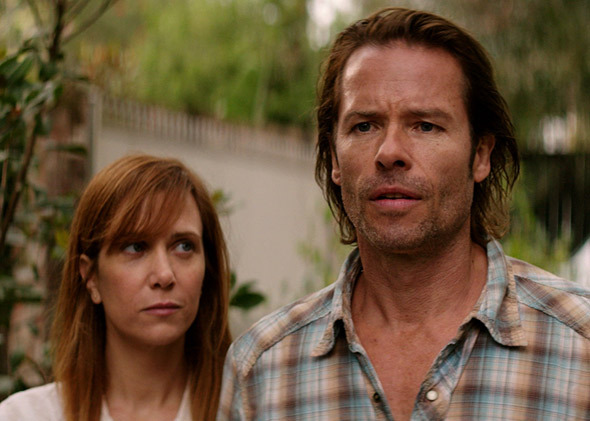 Her arrival coincides with a rare visit by Sabitha’s father Ken (Guy Pearce), an alcoholic and druggie whose irresponsible driving led to the death of his wife. Now Ken is trying to convince his father-in-law to invest in his latest get-rich-quick scheme, refurbishing a run-down motel in Chicago. McCauley isn’t buying; besides, he’s never forgiven Ken for the death of his daughter. The surfing documentary has been a cinema staple ever since Bruce Brown’s “Endless Summer” back in 1966, but I don’t think we’ve ever seen anything quite like “God Went Surfing with the Devil,” professional skateboarder Alexander Klein’s heady blend of Middle Eastern politics and wave-catching abandon. Klein’s doc follows activists with Surfing4Peace who are attempting to do their small part for world peace by shepherding a shipment of surfboards into Gaza. They envision Arab enthusiasts joining their Jewish counterparts in riding the waves of Gaza’s sandy beaches.